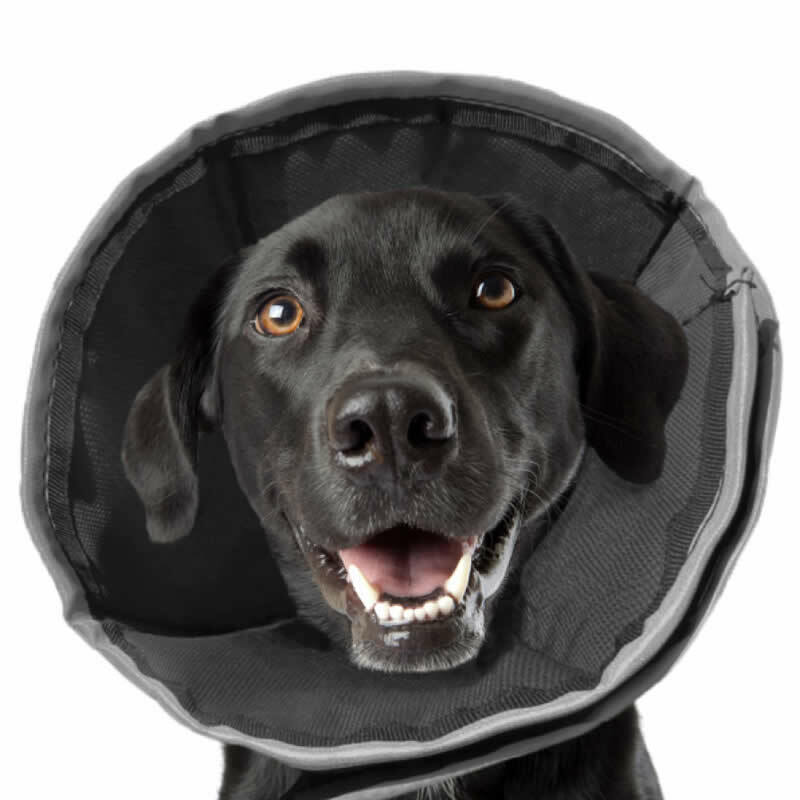 The ProCone is a safe, soft canine recovery collar. 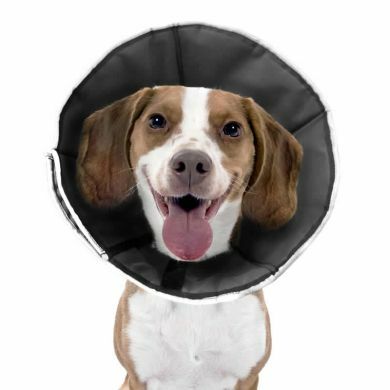 Give your dog relief from that uncomfortable plastic e-collar! It's bad enough being in recovery, but what if you had to wear a big loud inflexible inverted lampshade on your head? Those big plastic collars cut into your dog's neck and whack into everyting. They can even scratch your furniture. 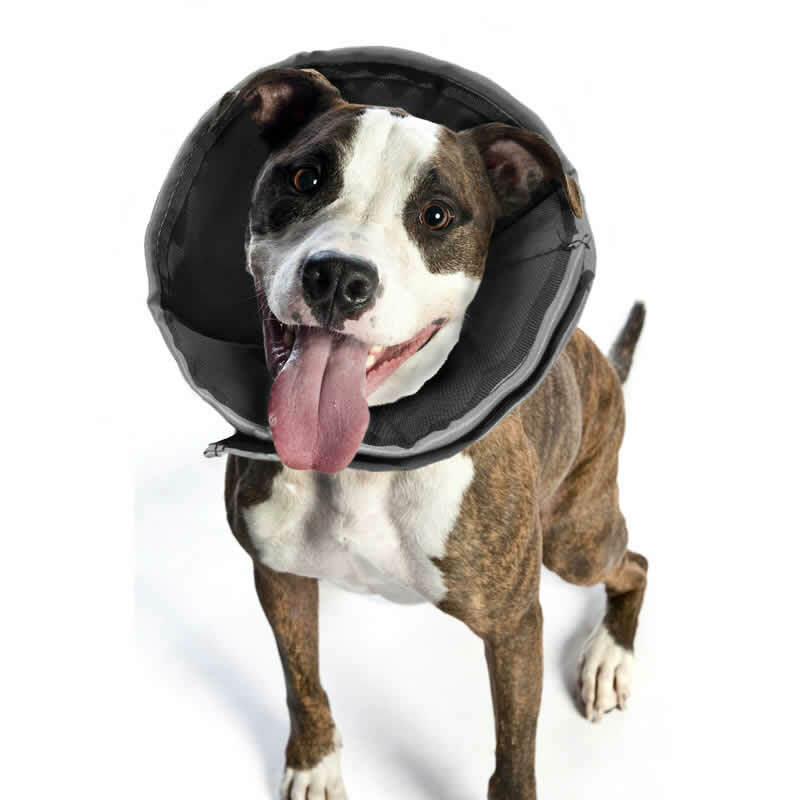 The Recovery Collar is made of a tough, water proof fabric. It's fully machine washable. There isn't any foam or backing board within it which makes it more breathable and prevents irritation behind the ears. Your dog can be comfy in any position due to the flexibility of the material. 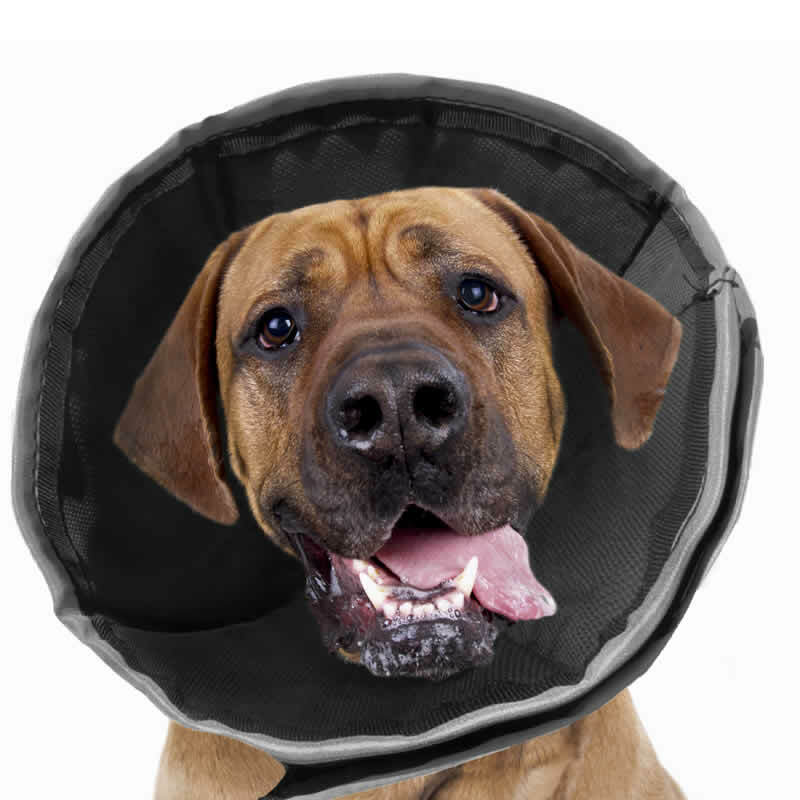 The Recovery Collar is straight forward to fit. 3. Be sure to keep only a two finger gap between your pet's neck & the collar. Fitting advice: Always go up a size if your dog is between sizes. very easy to put on. Great for our dog Kennedy to get around furniture. Love the way the collar can be folded back when needed and much softer than other collars. 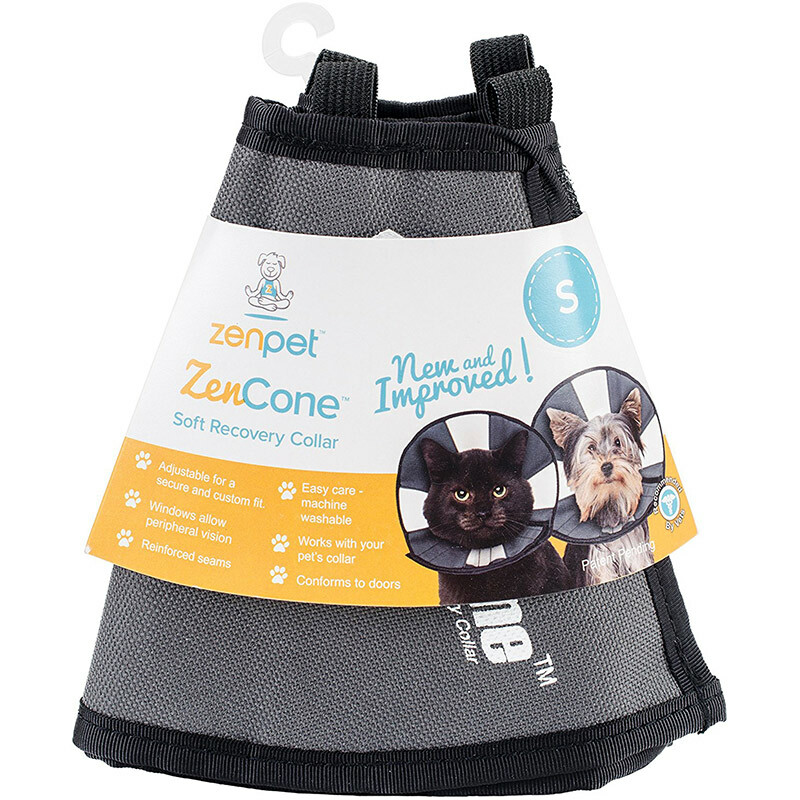 Read 14 customer reviews of ZenPet Soft Recovery Collar. The average customer rating is 4.5. It's easy to put on take off and it because it's soft, my dog fit in the car with it on, unlike when she had to wear the hard plastic type. It also is more comfortable for her and it doesn't hurt us when she walks into us with it on. She is MUCH happier while wearing the Zen Pet Soft Recovery collar than she was when she was wearing the hard Apex Collar. Kennedy is much more comfortable sleeping as the collar allows him put his head down without it being too hard. Thank you. Margot and Kennedy. The collar came very quickly. Thank you. We needed it for our little Lexi ,as she had fractured and wounded her tail tip (Waggie Tail). It is a huge improvement on the standard Elizabethan collar but she doesn't like it. It does however help keep her away from her injured tail, mostly.I'm not sure the clear plastic works. Lexi as managed to bend the entire collar so that it looks like a roll neck on a jumper this has permanently bent the plastic. Zoe I have to be honest She does not like it. I find it quite hard to put on. I am using her soft collar . I like the concept though it is better than the e collar. Had the elizabethan collar on and my dog HATED it. I looked everywhere for something softer and Waggle had it available. Amazing customer service, they put it through for me over the weekend and it arrived on Tuesday. Thank you so much. I don't know how useful the collar is, but I know I'd shop at waggle again as they have made it such a painless process! We have a Staffy with skin issues and needs to where a 'bucket' a lot! The bucket made it impossible for him to get through the dog door, and bruised our legs when he walks into us! We had to take it off for him to eat and he was always bumping into things and awful for him to sleep in.Other soft blow up tubes on the market didn't stop him from scratching his face. This soft recovery collar is perfect! Easy for him to wear, don't have to take it off for him to eat, he gets through the dog door with no problems and doesn't give us bruises on our legs! It stops him from scratching and chewing on his paws and sleeps beautifully with it on.Thank you Waggle!!!! My dog had an abscess on her foot pad. All we had was one of those very hard collars that are so uncomfortable. We found the ZenPet Soft Recovery Collar so much better for our dog. It is softer and much more comfortable to wear and sleep in. My dog was unable to get to her paw which was exactly what was required. Velcro is perfect to close and open the collar. We used the extra Velcro piece supplied but needed another piece as our dog is very small. My dog has made a full recovery now and she sends big woof woof and wag of her tail to Waggle to say thanks for having this product available for me.